Evolutionary biology has been a consistent theme in movies going back to the earliest days of cinema. Filmmakers come back to evolutionary themes because evolution is about transformation and transformation always makes for good drama and for good cinematic visuals. As it turns out, this summer has been a banner year for evolution at the movies as a large number of films have incorporated evolution. Evolutionary biology plays a central role in the plot of Luc Besson’s thriller Lucy (2014) which opens in the UK this week. Morgan Freeman’s character Professor Norman lectures about the untapped “evolutionary potential” within the human brain. While Scarlett Johansson’s Lucy accidentally consumes a wonder drug that transforms her into the next stage of human evolution. Technologically driven human evolution is also the theme of the Johnny Depp vehicle Transcendence (2014) whose tagline is “Evolve the Future.” Dawn of the Planet of the Apes (2014), the sequel to 2011’s Rise of the Planet of the Apes, literally visualizes the first film’s tagline of “Evolution Becomes Revolution” in its poster showing a horse-riding ape wielding a machine gun. Even the brainless Michael Bay CGI-fest Transformers: Age of Extinction (2014) has an evolutionary subtext right there in its title. Evolutionary themes this summer are not just limited to slick thrillers and high profile SF blockbusters. For example, the evolution of the human eye plays a significant role in the “science vs. religion” themed I Origins (2014). Given this rash of summer blockbusters featuring evolutionary-based plots I thought it would be fun to call attention to six somewhat obscure films from the past whose plots significantly feature evolution. Even the most strident anti-evolutionist recognized the anatomical and behavioral similarities between humans and other primates. For some people this fact had troubling implications: if the theory of evolution were true they believed it meant that humans were nothing more than glorified apes. Throughout the 19th century cartoonists produced numerous caricatures based on the premise of a human/primate connection. 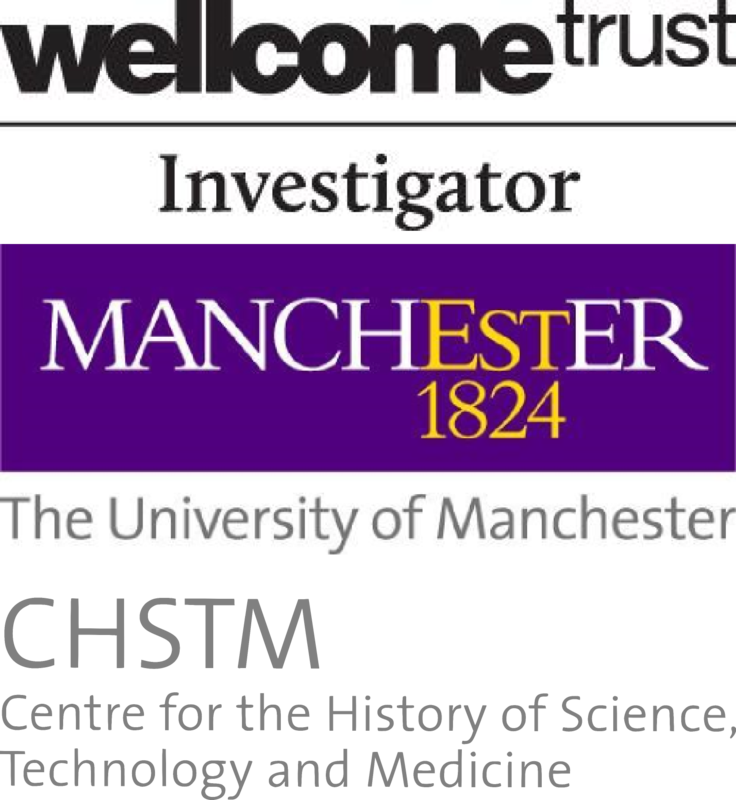 Some of the most famous of these involved putting Darwin’s head on the body of an ape. 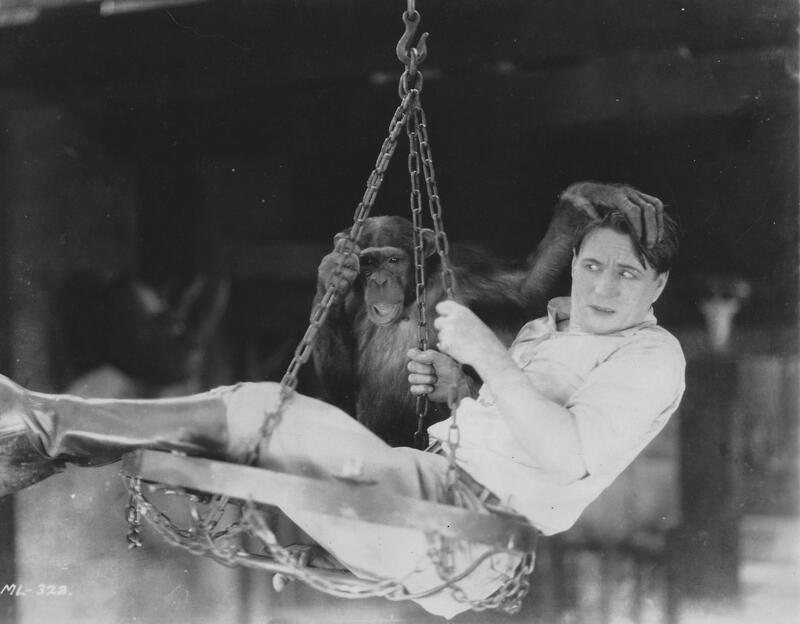 Several early films adopted the caricature of the ape-like human or the human-like ape for comedic purposes. 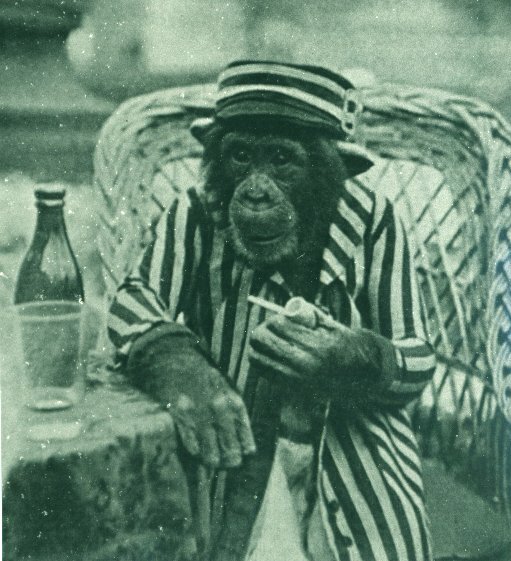 The distributor of The Educated Chimpanzee suggested that an alternative title for the film could be “The Evolution of Man.” Their summary of the film’s content plays up the evolutionary implications (as well as some unfortunate racial stereotypes) of watching an ape perform what are clearly human activities: “The monk smokes a pipe, reads a newspaper, eats his lunch like an old man, and does other funny tricks, all of which appear to prove the great Darwin theory, that man sprang from the monkey.” The popularity of this type of film is evidenced by the fact that this is not the only film released in 1901 called The Educated Chimpanzee featuring an ape acting like a human. Unfortunately, The Educated Chimpanzee is a lost film but I imagine its pipe smoking scene would have looked similar to this postcard photo. One of the most prevalent misconceptions about biological evolution is the concept of the “missing link.” The concept began in the 19th century when anti-evolutionists took an incomplete fossil record’s perceived lack of “transitional fossils” as evidence that the theory of evolution could not be true. The idea of the missing link spurred numerous searches in the hopes of providing evidence supporting evolution, especially those fossils connecting humans to the apes. The thought also arose that it might be possible to find the missing link not in the fossil record but amongst the living apes as the discovery of a previously unknown species of half-human/half-ape creatures might prove our evolutionary origins. There is a long history of the half-human/half-ape missing link being depicted in popular culture, but the idea gained traction around 1900 particularly when used for comedic purposes. Such was the case for this film that starred comedian Syd Chaplin who was the elder half-brother of Charlie Chaplin. Chaplin plays a poet who is hired to carry baggage for an expedition hunting for the “missing link.” He ends up finding the missing link himself and, thereby, proving his courage to the film’s love interest. The search for the “missing link” shows up in a number of other films in this time period. Its popularity was in part because the idea lent itself to easy plots within the popular “lost world” and jungle exploration based films of the 1920s and 1930s. Comedian Syd Chaplin hangs out with the “fake” missing link Akka before finding the “authentic” missing link in The Missing Link. Not every early film treated evolutionary theory as a joke. After the high profile Scopes “Monkey” Trial in 1925 many people saw the concept of human evolution as a dangerous idea and they considered pro-evolutionist scientists to be unstable individuals. This perception led to several films in which an unhinged scientist character goes to extreme lengths to prove that evolution is true. I have coined the phrase “mad evolutionist” to describe the characters in these films. These fictional scientists conform to the stereotype of the mad scientist but they design their evil experiments specifically to prove their “crazy” evolutionary theories about humanity’s connection to the animal world. The perceived threat of evolutionary thought to public morality was mirrored in films like Beast of Borneo. The Russian scientist Dr. Boris Borodoff’s desire to prove the evolutionary link between humans and animals is a clear signal to the audience that he is the film’s villain. He travels to Borneo to procure an orangutan for his experiments so that he can cross “the evolutionary bridge” between humans and apes. Interestingly, for a film that punishes a scientist for his evolutionary beliefs, the film goes to great lengths to show how human-like the orangutans are. The opening title card tells us the orangutan is “the nearest living creature in thought and action to the human being.” The hero’s pet orangutan, Borneo Joe, acts more human than the scientist and he makes the best case for the evolutionary connection between humans and apes. 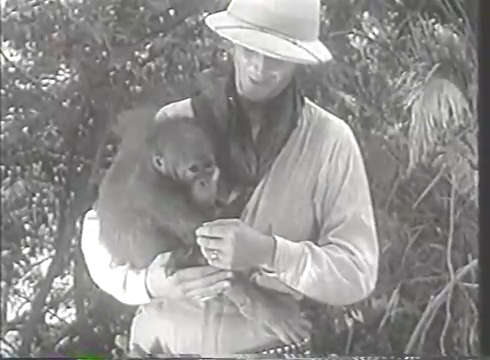 Hero, Robert Hunter, and his orangutan Borneo Joe in Beast of Borneo. Borneo Joe acts more human than the film’s villainous evolutionary biologist. The coelacanth was thought to have gone extinct 66 million of years ago in the late-Cretaceous period, so the discovery of a living coelacanth in 1938 caused an international sensation. The fish was considered a “living fossil” because it looked exactly the same as it did 65 million years ago. Coelacanths are related to the lungfish and, thus, they look like a transitionary species between fish and amphibians. For many people the coelacanth seemed to be a creature frozen in time. In Monster on the Campus the coelacanth is not just a metaphoric window into the evolutionary past, the fish has literally “resisted” evolution. In the film an irradiated coelacanth transfers its evolutionary “resistance” to several organisms causing them to revert to earlier evolutionary forms. For paleontologist Dr. Donald Blake this is a fortunate discovery that proves his evolutionary theories. Unfortunately, Dr. Blake’s reversion into a primitive hominid prevents him from publishing these results in the film. An irradiated coelacanth that has “resisted” evolutionary change in Monster on the Campus. It is hard to believe that this British made SF horror cheapie was Joan Crawford’s last film. In it she plays anthropologist Dr. Brockton who works for the self-titled “Brockton Research Centre.” Dr. Brockton finds a half human-half ape frozen in a cave that she names Trog. She claims Trog is the “missing link” between Neanderthals and modern humans, which sets up a confrontation with a religious zealot played by Michael Gough who believes that Trog is a monster spawned by Satan. This makes the film sound more intellectually interesting than it really is. The film’s science/religion tension is mostly bland and it merely provides weak plot motivation for Gough’s character to release Trog who goes on a mild “rampage” through the town. 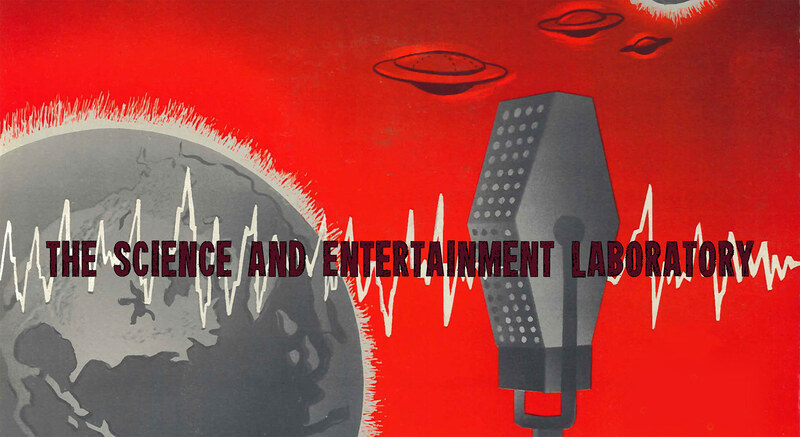 One fact we learn from this film: our hominid ancestors preferred classical music to rock and roll. Who knew? Not-so menacing missing link Trog on a mild rampage in Trog. This Roger Corman produced exploitation movie has gained a bit of a cult reputation over the last ten years. Evolution is a key element of the plot. But the film is a product of the late-1970s, so its plot also involves fears over toxic waste and genetic engineering. The plot mirrors one of the most common misconceptions about evolution as a process: the ladder of progress. In this conception evolutionary change is always progressive, so that every creature on the “lower” rungs is on a trajectory to evolve into the creatures on the “upper” rungs with humanity being the most evolved of all. 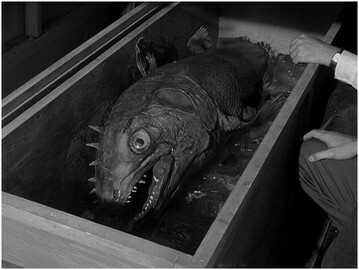 As with 1958’s Monster on the Campus the coelacanth plays a role in this film. It is clear that the “unchanging” nature of this living fossil leads some people to believe that those millions of years of “lost evolution” must somehow be stored up within the species just waiting to be unleashed. 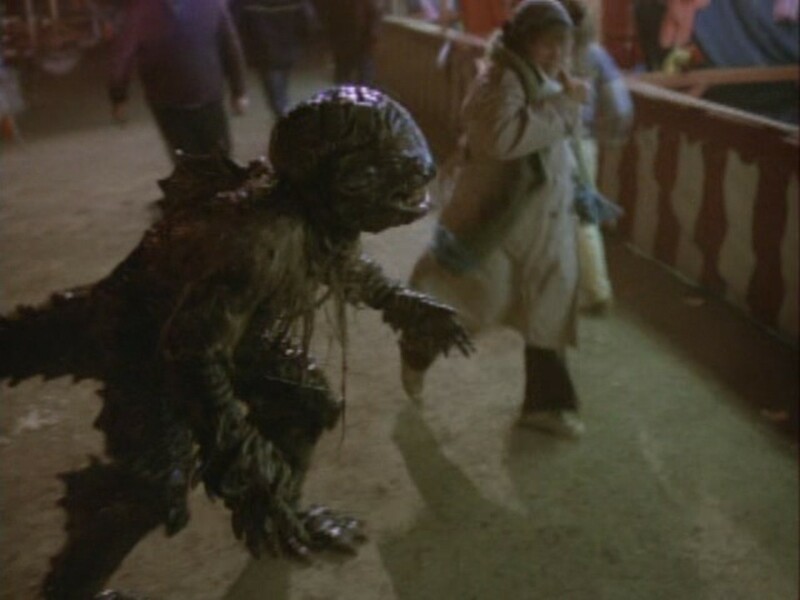 So, in this film when some coelacanth eat salmon treated with a gene altering growth hormone they quickly evolve into intelligent humanoid shaped monsters. To “further develop their incredible evolution” these hyper-evolved “humanoids from the deep” need to mate with human females, which leads to some highly questionable scenes that are responsible for the film’s cult status. This “humanoid from the deep” is looking to further its evolution.